Basil (Ocimum basilicum) is an herb from the Lamiaceae family. There are many varieties of basil, which are visually quite different from each other. The most common culinary varieties are sweet basil, lemon basil, Thai basil and holy basil. The composition of basil's essential oils and the resulting health benefits in some cases greatly vary among the different breeds. It contains eucalyptol, a common ingredient of cough suppressants and mouthwash solutions, an ingredient also used to treat inflammations of the sinuses (usually applied topically) and kills leukemia cells. Basil also contains eugenol (same as cloves) which is an anesthetic and a local antiseptic, as well as linalool, which according to animal studies shows indication of reducing stress levels when inhaled. There is not much information yet available on the toxicity of basil. It is toxic to mosquitos and there is potential for it to be used as an insecticide. Butterbur refers to the group of robust plants from the Asteraceae family in the Petasites genus. An alternate name for many species of this genus is Sweet Coltsfoot. Butterbut grows in temperate areas of the Northern Hemisphere. It has thick underground rhizomes, the flowers bloom in spring and are followed by large leaves during the growing season. Butterbur helps with headaches, especially migraine headaches (prevention and relief) and inflammation. 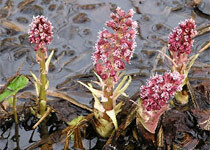 Butterbur extract is also an effective treatment for hay fever. Butterbur contains pyrrolizidine alkaloids, which are damaging to the liver and can be carcinogenic. The concentrations of these components are usually the lowest in the leaves and the highest in the stalks and rhizomes. The preparation of butterbar extract is therefore best left to an experienced healer or laboratory.